Summary: Most everyone knows that Santa Claus is also known as St. Nicholas. But who is the real figure who gave rise to this depiction? 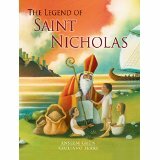 Anselm Grun has done an outstanding job in The Legend of Saint Nicholas at introducing this saint of the Church. He begins with the birth of Nicholas and explains that his name means “victory of the people,” a very appropriate name for a man who spent his life helping others. Grun focuses on several stories of Nicholas that show his desire to help others with no focus upon himself. This includes the famous story of helping a poor father with three daughters. The other stories are ones of miracles Nicholas was supposed to have performed during his life and even one after death. The illustrations are superb. They are well-drawn with a soft lighting that makes them inviting and could even tell the story without words. It is worth noting that this was originally published in German and explains that in some countries the celebration of Saint Nicholas with gifts occurs on his feast day which is December 6. Literary Elements: This book is biography. Though short, it fills in the life of Saint Nicholas and helps children to understand that he did more than just give out presents to children. He is shown to be a very devout man who served God and wanted people to put their focus on God rather than himself and his actions. Race/Gender/Culture/Economics/Ability: The depictions of race in this story are realistic as Nicholas was from Turkey. He is portrayed as one who did what he could with his abilities. But by trusting God, he is allowed to have greater abilities (i.e. walking on water, providing that grain was resupplied after distributing it to those affected by famine). The book also shows those who are less fortunate and that Nicholas helped by giving them what they needed to survive, but at the same time gave them a way to be able to work for themselves afterwards. Theological Conversation Partners: This would be a great book to talk about the differences in Saint Nicholas and Santa Claus. One can use this to point out that Nicholas was helping and giving the entire year, not just one night. Also, it can be used to help children understand how to rely on God rather than themselves. What differences do you see between Saint Nicholas in the book and Santa Claus? How and when does Nicholas take risks when he trusts God? Why is it important for us to know about Saint Nicholas and what he did? Saint Nicholas Day is different from Christmas. Why is this significant? This review was written by Union Presbyterian Seminary student Travis Milam. The Legend of Saint Nicholas by Storypath is licensed under a Creative Commons Attribution-NonCommercial 4.0 International License.